Let me start off by saying that I really enjoyed the book. When I first started reading it I had a hard time getting into it. However, once I got to know the characters I found I couldn’t put it down. The book starts off with the murder of a woman as she’s jogging through the woods. The person who killed her seems to be a bit psycho (not a stretch, right?) as he seems to be talking to another voice in his head. Another woman, Kathy, has been having dreams off and on for years that she doesn’t quite understand. As they become unmanageable, she seeks assistance and is told to start writing her dreams down when she wakes up so that she can try and piece together what’s triggering them. The dreams start occurring more and more often and she finally ends up confiding in her best friend. As they put the pieces together, they realized that the faces in her dreams match those of several murder victims. She also realizes, soon enough, that the murderer might possibly be in her own home town. I’m usually pretty good at picking out who the murderer is in these types of books and, although I was close, I didn’t quite hit the mark. I would definitely recommend this book to anyone who likes a good mystery story, but be prepared for a little paranormal activity as well. As for me, that just added to the fun. If your interested in a copy, I have twenty to give away. But you have to contact me today after visiting this blog. 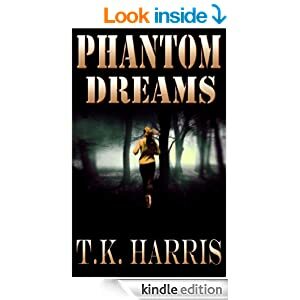 Otherwise, you can pick up a copy on your own at http://www.amazon.com/Phantom-Dreams-T-K-Harris-ebook/dp/B00D9GXUL8/ref=sr_1_1?ie=UTF8&qid=1399118169&sr=8-1&keywords=phantom+dreams.